We’ve all heard it before. A helpful friend wants to introduce us to a friend of a friend. They tell us all about how perfect they are for us, they show us a picture and hopeful, we agree to meet them. And that’s when Ben knew. The night they met he knew she was the one. He couldn’t quite put a finger on it, but Ben knew that Nadine was the one he wanted. By the third date things were going well. They enjoyed each others company very much and after spending another evening together Nadine realized that Ben was the one she’d been searching for. 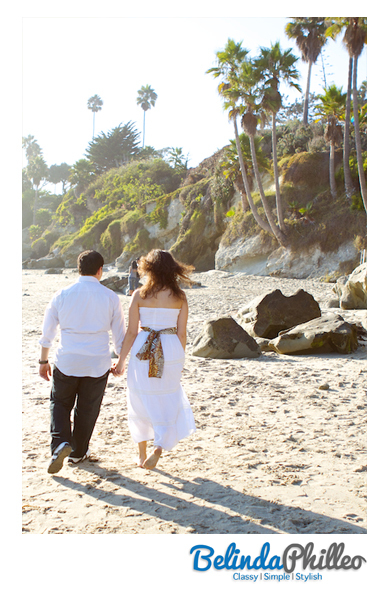 For their engagement photos they chose a spot close to their hearts in Laguna Beach, CA. This is the very spot where Ben’s surprise proposal was written in the sand. That afternoon had some beautiful warm sunlight and I couldn’t resist catching a bit of lens flare. The photo below is one of my favorites from the day. I love Nadine’s gorgeous happy smile! She’s going to be a stunning bride. If you’re interested in an Orange County Engagement Session Or Portrait Session please contact me for more information!